Roland's RD series of stage pianos has a lineage that stretches back into the mists of time, and in recent years it's been headed up by various models taking the 'RD700' moniker. 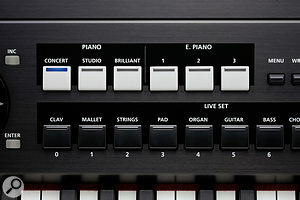 All of them have offered a feature set that looks to be predominantly suited to serious live use: an 88‑note, weighted keyboard; an emphasis on acoustic and electric piano sounds, supplemented by a broader 'gigging' sound‑set; MIDI controller facilities; and a fairly straightforward user interface that blends ease of setup and sound selection with some degree of editing flexibility. 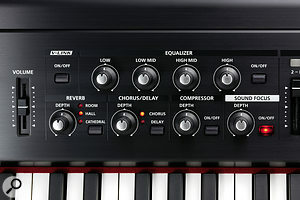 The RD700GX, released in 2008, upped the ante in this competitive part of the synth/keyboard market, not least because of its notably fine 88‑note keyboard, which had textured, ivory‑feel keytops and a convincing 'notch' in the keystroke that emulated a good acoustic piano's escapement action. Now comes the NX, the subject of this review, which appears to supplement the GX in Roland's line‑up rather than directly replacing it. It retains lots of the best aspects of the GX, improves on some of them, but unexpectedly loses the odd feature along the way too. So have Roland finally discovered the formula for the perfect stage piano, or is this just a variation on a theme? The RD700NX's effects and EQ controls. 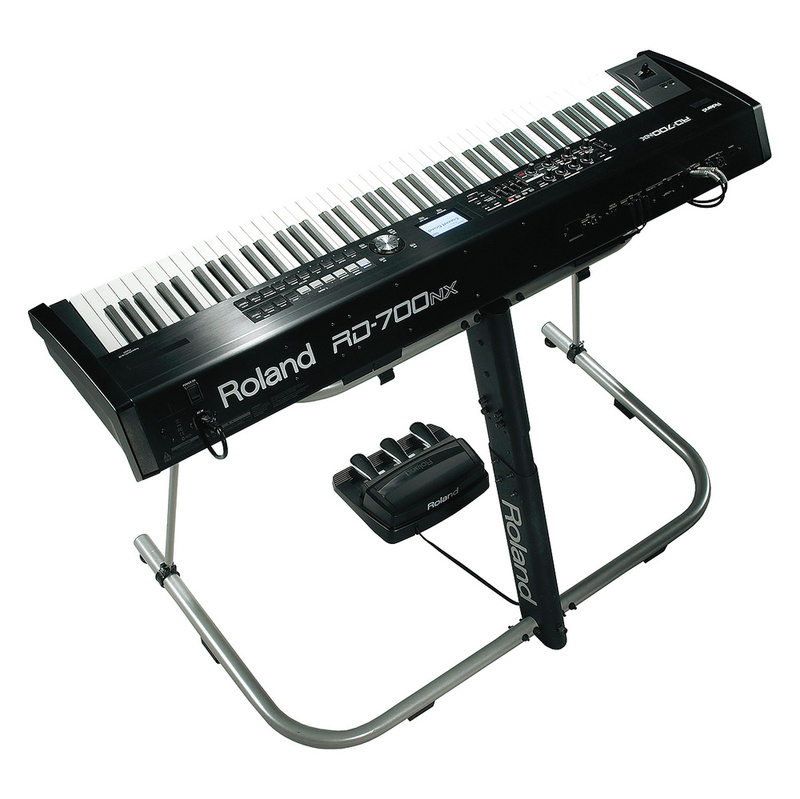 The RD700NX uses Roland's top-of-the-line PHA III 88‑note weighted keyboard, which, like the RD700GX's PHA II, distinguishes itself from the competition with its textured, ivory‑feel keytops and escapement action. It is undoubtedly a classy affair, with the front edges of the black notes beautifully sculpted and the escapement resistance only noticeable when playing very quietly, which is just as it should be. The white keys are more textured than the black keys, and they offer quite a bit more friction when you slide your fingers back and forth — unusual, but by no means a problem. Slightly disappointing, but by no means unexpected, is that there's no aftertouch. Lurking in a panel to the left of the keyboard is the typical Roland 'bender', a combined left‑right pitch‑bend and push‑forward modulation joystick. Like all benders before it, it's sprung in both directions, and, though perfectly intuitive, it can infuriate some users who are more used to conventional pitch and modulation wheels. Above the bender are two buttons that can be assigned to control duties including turning effects on and off, applying octave transpositions, and so on. The main control panel is gently angled up towards the player and is centred around a white‑on‑blue backlit LCD screen, which has enough resolution to display little graphical backdrops to some sound-selection pages. To the left of it are controls for configuring various effects, sound layering and keyboard splits. On the right lie preset-selection buttons and a big value dial, surrounded by cursor and other buttons used for navigating the NX's editing pages. Overall, the RD700NX is a seriously chunky bit of kit, with metal panels and thick plastic end cheeks. The rear panel slopes at a jaunty angle, which looks good and makes accessing its sockets significantly easier. It weighs 25kg (55lbs), which, when combined with its bulk and length, is on the limit of what some will be able to cope with single‑handedly. If you're planning on putting this in a flight case, make sure it has wheels. What about the internal organisation? 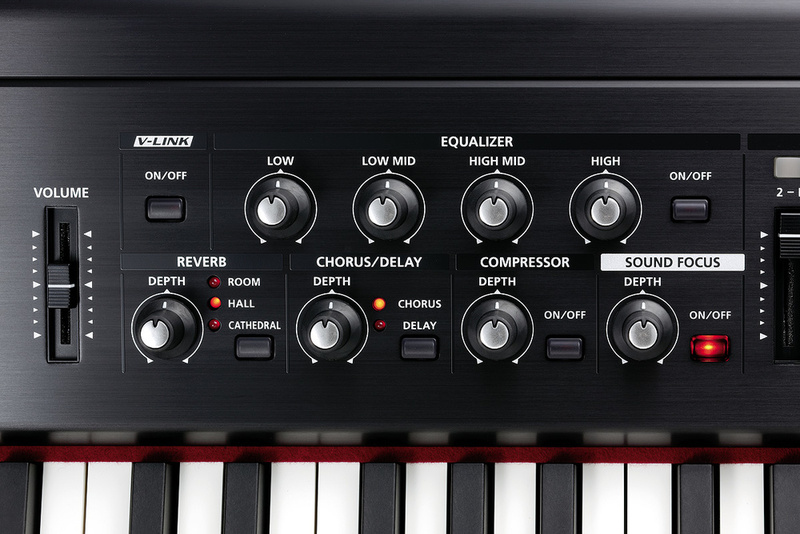 The NX offers several distinct sound generation systems, comprising 'Supernatural' acoustic and electric pianos, VK‑derived tonewheel organs, and more familiar 'PCM' multisample playback. Also tucked away inside the NX are various drum kits and a GM2 soundset to provide Standard MIDI File playback compatibility. The RD700NX's preset buttons make patch selection quick and easy.Although it's technically more than 16-part multitimbral, the RD700NX played live can produce four parts simultaneously. Roland terms these parts 'layers' and calls them Upper 1/2 and Lower 1/2, but in fact it's up to the user to decide how they're configured. From editing screens accessed via the central Layer Edit button you can create multi‑layer sound stacks, or set up keyboard splits, zone overlaps, and even velocity switches between one layer and another. In an improvement over earlier RD700 models, there seems to be no restriction on what sounds can be loaded, so you can have multiple Supernatural sounds, or several different tonewheel organ registrations in different key zones, for example. The four layers also get dedicated hardware volume faders. As for effects, there are single global reverb and delay/chorus processors, as well as a compressor and EQ, and basic controls for all of these lie within easy reach of the left hand. If you're thinking shared effects sound a bit 1990s, worry not: each layer is also equipped with its own pair of specced‑up multi‑effects units (connected in series), and these offer phenomenal processing clout, with no less than 84 algorithms on offer covering EQs, dynamics, 'lo‑fi' treatmens, filters and distortion, through to delays, chorus, reverbs, pitch shifting and more. In practical use, the NX is ready to go in about six seconds, and basic sound selection can be done with a single prod of a finger, as buttons are marked with sound names, not unlike on home organs or a typical child's keyboard! If the three flagship acoustic and electric pianos and 10 basic additional sound types don't satisfy your needs, you just spin the value wheel to explore other ready‑made variations. Using this system, 300 factory programs can be quickly recalled, and there's also a 100-slot user bank for storing and recalling your own creations. Not all is quite what it seems, though: see the 'Memory Lapse?' box to get the full story on the NX's preset and memory organisation. Being a live‑oriented, predominantly preset‑based machine, the RD700NX doesn't offer you full synth‑style editing scope. However, some tweaking is certainly possible. With one of the Supernatural acoustic piano sounds selected, pressing the Tone Edit button brings up an editing screen that allows quick adjustment of a host of piano‑specific parameters (and which almost certainly point to a hybrid sampled and modelled sound-generation system). You can choose from 24 piano variants, adjust lid height, damper noise, duplex scale resonance, string resonance, key off resonance and hammer noise. You can also tweak stereo width, 'Nuance' (some sort of subtle phase‑related effect), 'Tone Character' (mellow to hard) and 'Sound Lift' (a sort of dynamic-range compression). A further screen allows access to complex editing of velocity response, microtuning variations, sympathetic resonance and EQ. For the Supernatural electric pianos there's another set of parameters: 'Bar Angle', Pickup Distance, Bell/Thump Balance and Bell Character. Additional edit screens give you access to a multi‑effects processor and dedicated keyboard-amp simulation that can include tremolo and auto-pan effects. For all the other sounds, Tone Edit gives quick access to the associated layer's two multi‑effects processors, and some general parameters, such as mono, legato and polyphonic modes, portamento and bend range. One more edit page offers adjustments to filter cutoff and resonance, plus attack, decay and release times (which sometimes seem to relate to the synth architecture's amplifier, and sometimes to its filter envelope). These are all presented as relative values, so you tinker with what the sound already offers, rather than taking control of those parameters absolutely. I can confidently say that the acoustic pianos are the best I've heard from Roland, and they bear comparison with any sampled or modelled systems currently available, whether hardware or software‑based (and that includes Roland's own V‑Piano, I might add). The Concert Piano sound is woody, dark and brooding when played quietly, in the way that many concert grands can be, but takes on a brilliant, steely authority when played harder. Dynamic response is superbly matched to the keyboard action, and the overall dynamic range is prodigious, with no perceptible switching of samples. The Studio Piano is brighter, more superficially appealing, and better suited to luxurious pop styles, but just as complex and playable. The Brilliant Piano is the most hyped of the three, certainly more aggressive in the tenor and bass, but still a million miles from the trashy 'House Piano' patch typical of multi‑purpose workstation keyboards. Overall, the piano sounds retain more movement and complexity in the decay phase than is usual for hardware instruments, although there can still be more than a hint of sterility when you scrutinise individual notes held for more than a few seconds. Sympathetic resonance is implemented well, generating interactions between individual notes and chords, and an expansive shimmer when the damper pedal is depressed. While I'm on the subject of pedalling, the NX works well with the supplied DP10 pedal to produce half‑damped and half‑pedalling effects, and generates a subtle damper 'scrape' noise on pedal‑down. This is strangely metallic in quality and long in duration — I haven't heard a real piano do anything quite like it — but it didn't bother me when heard in context. To get some perspective I compared the RD700NX to the multi‑gigabyte libraries of Synthogy's Ivory II, and while there are obvious tonal differences between the pianos on offer, the Roland wasn't outclassed in the slightest, which is pretty impressive. The RD700NX's electric pianos are also sophisticated and successful. The front‑panel 'Tine E Piano' Rhodes is very appealing, has a hard tremolo/autopan, and never becomes too heavy and loutish. The variations on the Rhodes are good too — a driven Dyno and some swooshy Suitcases — though on the whole they're quite bright and full. It seems the NX is not naturally given to generating those thick, sometimes drab early Rhodes tones that can work really well to glue together a combo. You also have to delve into the menus to tease out the really delicate, bell‑dominated tones that can be so effective for quiet accompanying. The Wurlitzer sounds are certainly dynamic, but some of the amped variants are of limited use, descending into a distorted mulch. Other keyboard sounds are mixed. There are uprights pianos in name, but they simply appear be slightly mangled versions of the grands. I don't think they'd fool anyone, and Madness tribute bands need not apply. Similarly, the Honky‑Tonks are hideous, detuned monstrosities that you could never use seriously. If you're into 'character' pianos, it's unlikely the NX will do it for you; try the Nord Piano 88 or specialist software libraries instead. On the other hand, the Clavinets are superb, and there's any number of harpsichords, bells and excellent mallet instruments. As for the rest of the sounds on offer, many are very fine indeed. The Hammond organ patches make use of the built‑in VK‑derived tone generator, and sound weighty and authoritative, taking advantage of some excellent rotary-speaker effects. Sampled highlights include some lush strings, surprisingly believable acoustic guitars, really outstanding acoustic and synth basses, and some solo brass patches that are much better than you'd ever expect. The NX's range of preset synth sounds feels a touch limited, and tends towards brassy leads and D50‑inspired, twinkly, new‑age genres. But all the usual suspects are there, so you'll be able to whack out 'Jump' and 'The Final Countdown' no trouble. In short, all bases are well covered for the gigging player: this is by no means only a piano. The RD700NX with optional KSG8 stand and RPU3 pedal unit. In a world where a cheap laptop can generate a whole universe of sound, and big‑money workstations offer full blown sequencing, sampling and every kind of synthesis, married to a dedicated control surface, a product like the RD700NX can look a touch anaemic. Why would you spend this much money on something that's apparently a glorified preset machine? Well, it's certainly not without its flaws and frustrations. If the sound you need isn't amongst the 1000 on offer, you're stuck — especially now that you can't even turn to SRX cards to expand your options. The sound editing on offer is neither deep nor particularly hands‑on, and it's inevitable that at some point, live or in the studio, some users will find themselves having to compromise, or turn to a supplementary synth or ROMpler that has a broader sound palette. It doesn't help that the NX's patch and memory structure can feel obscure and unhelpful, nor that in the early stages it's far too easy to completely wipe complex multi‑layer Live Sets you're constructing with a single errant button press before you've had time to store them. This is down to the user interface and display combination, which hasn't evolved much, if at all, from the first RD700 models, and as a result is looking and feeling quite dated. The use of four non‑motorised faders to control eight internal and MIDI layers, nine drawbars and 16 assignable real‑time parameters is far from ideal, and looks miserly when you consider just how prevalent the touchscreen is nowadays. The faders don't even offer a 'pickup' mode; parameters only snap coarsely to new values when you move a fader to a new position. However, what Roland have done with the RD700NX, like RD700s before it, is to pull off a balancing act between flexibility and real‑world usability. They've always been superb gigging instruments: in a theatre pit, my now-sadly-departed RD700SX handled everything asked of it, and would let me find, tweak, name and store a decent sound before the other workstation keyboard players had finished navigating their way through their 15th sound bank. The NX offers more, and better, of everything. The keyboard action and sounds are great, as is the provision of two effects processors per layer. Live Set recall is quicker than before, and does not silence held or decaying tones. Pedal assignment is hugely flexible, and there's now even an option for a pedal tap to step through Live Sets one by one. The NX makes a fine master keyboard, and all sorts of little setup options — like being able to override EQ settings programmed into a Live Set, to help cope with problem PAs — are really valuable. In the end, it comes down to this: for many keyboard players, the RD700NX will be the perfect tool for the job. Significantly more capable than the average stage piano, and yet still very much a hands‑on, player's instrument, it'll slot effortlessly into a variety of different roles and styles. Yes, there are eccentricities, and maybe an RD700 of the future, with a big touchscreen and still greater flexibility, would be an even more enticing prospect. But that doesn't matter. By any standards, the NX is a serious, versatile stage keyboard with a lot going for it, and it's easily the best RD700 yet. The RD700NX has relatively few direct competitors, combining, as it does, the broad flexibility of the workstation with the immediacy of a dedicated piano‑only stage keyboard. The slightly cheaper Yamaha CP5 comes closest, though it has fewer non‑piano sounds, arguably less convincing acoustic pianos, and less sophisticated MIDI control features. Coming in at around half the price of the RD700NX the Kurzweil SP3X is correspondingly more basic in most areas, but its 88‑note keyboard can claim aftertouch capability. The most expensive of the lot, the Nord Stage EX overflows with vibe, and boasts piano sounds at least as good as Roland's, and certainly more varied. It's also a much better synth and Hammond clone, but offers no ROMpler sounds whatsoever. Befitting its pro‑level appearance and price tag, the RD700NX has good connectivity to the outside world. There are unbalanced quarter‑inch and balanced XLR stereo audio outputs, and a headphone socket. A single five‑pin MIDI In socket is supplemented with no fewer than three separately addressable MIDI Outs (of which one can also act as a MIDI Thru). There are three quarter‑inch pedal inputs, one for the supplied DP10 damper and two for additional switch or continuous-type pedals. Alternatively, Roland sell a piano‑style, three-pedal unit (the RPU3), which can give you traditional una corda, sostenuto and damper functions (amongst other things). Alongside a display contrast pot there are two USB sockets; one an 'A' type for connecting a memory stick, and the other a 'B' type for hooking the NX to your computer. Power comes in on a standard three-pin IEC socket, and the rocker power switch is protected from accidental knocks by a plastic surround. Missing from the rear panel are the Roland SRX sound expansion card slots that were present on the RD700SX and GX. I'm guessing that this won't be a deal‑breaker for most people — it's not as if there aren't plenty of sounds on offer already — but it could be a drawback if you particularly wanted to equip your RD700 with a broader range of world‑music, synth or other specialist sounds. You might be better off with the GX, if that's the case. As I mentioned elsewhere in this review, getting going with the RD700NX and selecting its basic sounds is very intuitive indeed. But in the spirit of Japanese synths the full truth about preset selection and memory structure emerges only slowly, obscured by terminology and an operation manual that seems deliberately economical with the facts in many places! So here's the skinny. The RD700NX actually has 1000 tones, presets, whatever you like to call them. The front-panel buttons offer no way to select these directly. Rather, they recall what for other synths is often called a 'performance' — a snapshot of a more complex setup that could include multiple tones loaded into the four layer slots, along with effects and performance settings. Roland term this a 'Live Set'. You only get to explore the full range of 1000 tones when you go into the Layer Edit screens, then you can step through them one by one using the value wheel, or use the front-panel buttons to jump to the first tone of a corresponding instrumental category. So the moral of the story is this: there are more sound variations and types on offer than is suggested by the Preset bank of Live Sets provided. Keeping up? You'll need to. If you adjust one of the 300 Live Sets in the 'Preset' bank, or create your own from scratch, you can store it to a 'User' bank, which has 100 slots. Entire User banks can then further be saved to some other mysterious part of the RD700NX's internal memory as a 'Live Set File', so you can create archives of your preferred sounds ready for later recall. How many of these can be stored? I don't know. The manual doesn't say and I stopped counting when I'd saved six Live Set Files. In any case, individual Live Set Files in the internal memory can be copied to an inserted USB memory stick, and vice versa, so you're unlikely to run out of storage space. As if this weren't enough, an alternative recall system for Live Sets exists, called 'Favorites'. 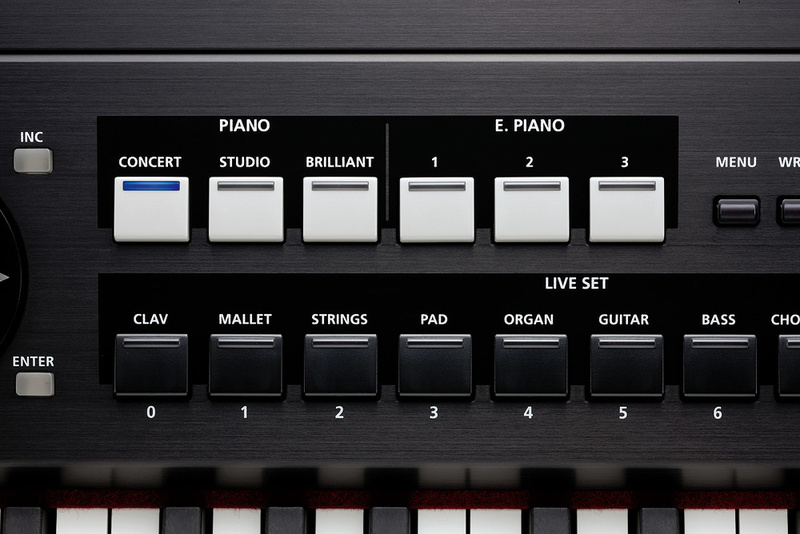 It allows you to store any Live Set to an individual front-panel button, ready for recall with a single touch. Favorites mode is selected by pressing the Preset and User Live Set buttons simultaneously, which then gives you quick access to four banks of 10 Live Sets. As well as the fine keyboard action and broad sound set, the RD700NX offers a few features you might not expect to see, but which could add a lot of value for some users. Accessed via a dedicated front stop/start button, a range of preset drum patterns can be triggered. The sounds are very good, and the stylistic range impressive, but as a whole the feature feels badly undercooked. If only Roland had spared a few more buttons to equip these drum patterns with easily‑triggered intros, fills and endings, you'd have a seriously useful rehearsal tool on your hands. But there's nothing of the sort, and what's worse is that the start button is far too easy to nudge inadvertently, which could be catastrophic in a live situation. It's also very unclear how rhythm volume can be adjusted relative to other parts, and, annoyingly the rhythm and tempo often changes when y,ou call up a new Live Set. Disappointing all round. Less contentious are song playback features. Plug in a USB stick (which needs to have been originally formatted by the NX, and can only be inserted or removed when it's turned off) and you can load Standard Midi Files to an internal playback sequencer. Audio files in MP3 and WAV format can also be played, with a varispeed option of up to 25 percent faster or slower (the time‑stretched quality is not bad at all). During playback, all normal functions stay active, so this is very much a 'play‑along' feature, especially when you consider the karaoke‑style centre‑cancel function buried away in the menus. Strangely, the onboard MIDI sequencing facilities can't be used to record your own performances. However, you can record what you do as audio, direct to a USB stick. The process is a little convoluted, but it's there. Of most value, by far, are the dedicated MIDI controller functions. Lurking behind the four internal sound layers are four MIDI layers (a front panel toggle switches over the layer buttons-and sliders to work on these instead). It's not immediately obvious, but User bank Live Sets can store and recall information about both internal and MIDI layers and their associated keyzones, plus MIDI program changes, MIDI Out socket and channel assignments, and a whole lot more. One thing that's good to see is that the USB and five‑pin MIDI work separately and concurrently — not always the case with many comparable keyboards. Excellent, tweakable, state‑of‑the‑art piano sounds. One of the very best 88‑note keyboard actions currently available. A comprehensive sampled sound set covering orchestral and band instruments. Good real‑time control facilities, with plenty of pedal inputs. Limited programmability compared to a workstation or synth. The limited provision of only four front‑panel faders struggles to cope with all control duties. The sound set is no longer expandable with SRX cards. The complexities of patch and memory structure are far from obvious. It's not without its limitations, and it won't suit everyone, but Roland have pitched the RD700NX's feature set just about right to make it a desirable and formidable tool for any gigging keyboardist.